Context: The most memorable of Charles Dickens’ characters, Miss Havisham, the old jilted dowager who lives in a ruin of a mansion and insists on wearing her wedding dress every day, wants to see a boy play. The boy is no one else but our narrator, Pip, who was then a young orphan living with his sister and her husband in poverty. We went into the house by a side door - the great front entrance had two chains across it outside - and the first thing I noticed was, that the passages were all dark, and that she had left a candle burning there. She took it up, and we went through more passages and up a staircase, and still it was all dark, and only the candle lighted us. To this, she returned: 'Don't be ridiculous, boy; I am not going in.' And scornfully walked away, and - what was worse - took the candle with her. This was very uncomfortable, and I was half afraid. However, the only thing to be done being to knock at the door, I knocked, and was told from within to enter. I entered, therefore, and found myself in a pretty large room, well lighted with wax candles. No glimpse of daylight was to be seen in it. It was a dressing-room, as I supposed from the furniture, though much of it was of forms and uses then quite unknown to me. But prominent in it was a draped table with a gilded looking-glass, and that I made out at first sight to be a fine lady's dressing-table. Whether I should have made out this object so soon, if there had been no fine lady sitting at it, I cannot say. In an arm-chair, with an elbow resting on the table and her head leaning on that hand, sat the strangest lady I have ever seen, or shall ever see. She was dressed in rich materials - satins, and lace, and silks - all of white. Her shoes were white. And she had a long white veil dependent from her hair, and she had bridal flowers in her hair, but her hair was white. Some bright jewels sparkled on her neck and on her hands, and some other jewels lay sparkling on the table. Dresses, less splendid than the dress she wore, and half-packed trunks, were scattered about. She had not quite finished dressing, for she had but one shoe on - the other was on the table near her hand - her veil was but half arranged, her watch and chain were not put on, and some lace for her bosom lay with those trinkets, and with her handkerchief, and gloves, and some flowers, and a prayer-book, all confusedly heaped about the looking-glass. It was not in the first few moments that I saw all these things, though I saw more of them in the first moments than might be supposed. But, I saw that everything within my view which ought to be white, had been white long ago, and had lost its lustre, and was faded and yellow. I saw that the bride within the bridal dress had withered like the dress, and like the flowers, and had no brightness left but the brightness of her sunken eyes. I saw that the dress had been put upon the rounded figure of a young woman, and that the figure upon which it now hung loose, had shrunk to skin and bone. Once, I had been taken to see some ghastly waxwork at the Fair, representing I know not what impossible personage lying in state. Once, I had been taken to one of our old marsh churches to see a skeleton in the ashes of a rich dress, that had been dug out of a vault under the church pavement. Now, waxwork and skeleton seemed to have dark eyes that moved and looked at me. I should have cried out, if I could. 'Who is it?' said the lady at the table. 'Do you know what I touch here?' she said, laying her hands, one upon the other, on her left side. She uttered the word with an eager look, and with strong emphasis, and with a weird smile that had a kind of boast in it. Afterwards, she kept her hands there for a little while, and slowly took them away as if they were heavy. 'I sometimes have sick fancies,' she went on, 'and I have a sick fancy that I want to see some play. There there!' with an impatient movement of the fingers of her right hand; 'play, play, play!'" Great Expectations is Charles Dickens's thirteenth novel. It is his second novel, after David Copperfield, to be fully narrated in the first person. 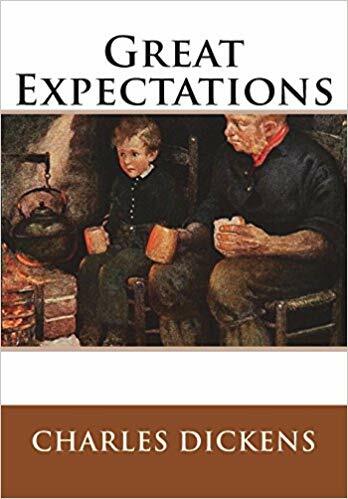 Great Expectations is a coming-of-age novel, and it is a classic work of Victorian literature. It depicts the growth and personal development of an orphan named Pip.